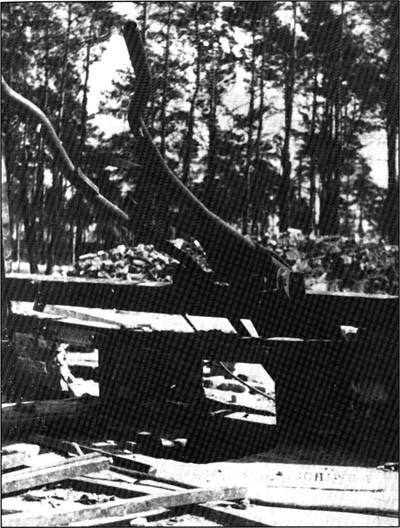 Ruins of the 8-muffle furnace of Krematorium V, northwest corner, photographed in 1945-46, with, a “Leichenbrett” (metal corpse-charging stretcher) resting on its rollers. At ground level, two lower openings where the [human] ash bins were placed. In the background, the debris of the building, carefully heaped up. 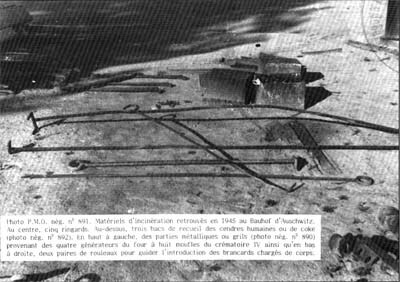 Krematorium equipment found in the Auschwitz Bauhof in 1945. 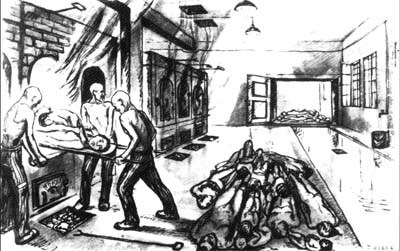 Sketch by David Olère, dating from 1945, showing the furnace room of Krematorium III, with three prisoners charging corpses loaded on a stretcher, using a technique slightly different front that described by Henryk Tauber. The pair of movable rollers visible on the end furnace is unused and replaced by an iron bar or piece of wood to guide and take the weight of the stretcher. Note the faithful representation of the fire irons used.